Standing on the initiative of the Foundation of Faculties of Nusa Tenggara, known by Letnan Kolonel Minggoe and Vice Chairman I, Governor of Sunda Kecil, Teuku Mochamad Daoedsjah. 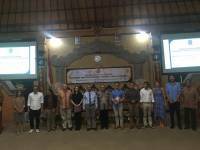 This Foundation is working with people who have special expertise in the fields of literature, such as Dr. R. Goris, Dr. Ida Bagus Mantra and I Gusti Ketut Ranuh. These people, in addition to preparing the things pertaining to the physical, moves well as a link, to get people who will be professors (lecturers), especially those who will be the leaders of the faculty which will be built up. Someone who was successfully contacted, who will be chairman is Prof. Dr. Poerbatjaraka, who was then Dean of the Faculty of Literature and Culture at the University of Gadjah Mada. The lecturers who successfully contacted, especially workers who have a doctorate and has gained international name for his scientific achievements at that time, is (1) Prof. Dr. Poerbatjaraka, (2) Dr. R. Goris, (3) Prof. Dr. Ida Bagus Mantra, and (4) Prof. Dr. Swami Ajarananda. After completion of all preparations so that being settled the opening day, on September 29, 1958. The name that is given is the Faculty of Letters Udayana. However, the original name of the plan is Udayana Faculty of Letters and Cultures. The word “Cultures” was then removed at the instigation of Prof. Dr. Prijono, because the word alone contained “Literature Cultural” meaning. Thus, the term literature contains a very broad sense. At its inception (September-December 1958), Faculty of Letters Udayana taken care of by the Foundation of Faculties Nusa Tenggara, but has starting on January 1, 1959 officially became a part of the University of Airlangga. Since then the Faculty of Letters Udayana name was changed to the Faculty of Letters until now. Currently, the Faculty of Letters Udayana University continued to show itself as the faculty of arts and humanities as reflected of the view that the terms of the lobby building with philosophical nuances that underlie philosophical fairy Balinese life. With ornate decoration view which is themed screenings as “Pemutaran Mandara Giri” on ornament bight kuri in multi-story front building lobby, with the establishment of the statue of Goddess Saraswati in the lobby, and with a great standing of Dewi Saraswati statue at the same place, and attached gracefully with two inscriptions establishment of the faculty is expected all this can be a source of inspiration that is growing steadily towards increasingly resounding success, that success because there is a strong willingness to understand the continuity of the past with the present to the future brighter. As an institution of higher education, Faculty of Letters Udayana University has a vision (or a view to the future) and missions (tasks and obligations that must be done to glorify the institution), in order to implement or fill out the vision outlined. In order to develop the Faculty of Letters Udayana University forward, required the development direction that clearly are able to raise the role of all parties to make the Faculty of Letters Udayana University as a center for the development of the humanities, and could produce graduates who are competent, professional, and have high competence to compete in the global era, but not uprooted from the cultural based of Balinese culture, as one of the elements of national culture. Faculty of Letters Udayana University is constantly improving the diversity and quality of education, research, and community service. Thus in time the Faculty of Letters Udayana University can establish itself as a key testament (that is able to open the treasures of the treasury of the Balinese culture), as a fire in pahoman (which is able to provide information to the people who experienced the dark), and as the revealer of the people (to deliver people to happiness inner and outer). Organizing the higher education through the system and the learning process that has the higher competence. Implementing and develop cooperation with various parties (domestic and foreign) in various fields, in order to improve the quality of Tri Dharma Perguruan Tinggi, management, and quality in serving. Inventing Faculty of Letters Udayana University as an institution of higher education that is actively building a society based on cultures. Developing the research and community service that meets the interests of the academic society, with regard to the needs of society. Increasing the capability and professionalism of organizational management and leadership oriented infrastructure services in high grade. Developing the higher education reliable and representative to organize higher education in high quality. Propelling the blossoms grow of majors and professional study programs are highly competitive, to optimize the sustainable existence of the Faculty of Letters Udayana University in particular and Udayana University in general.